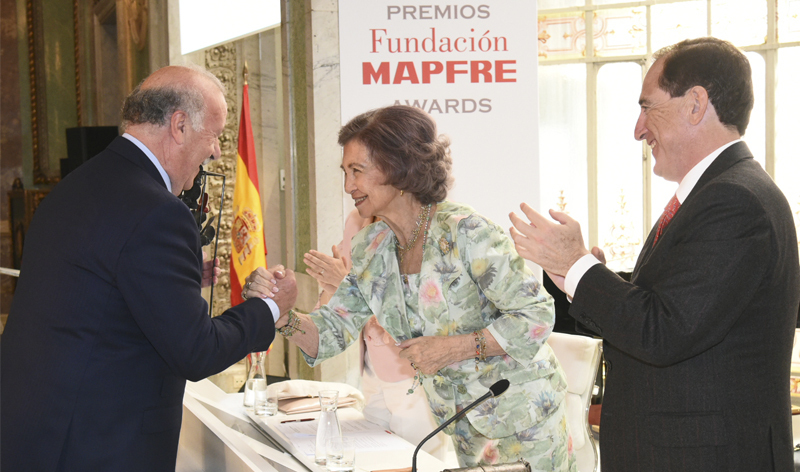 Fundación MAPFRE presented its Awards today, Thursday, June 14 in Madrid, the objective of which is to recognize the effort of institutions and individuals whose day-to-day work contributes to improving society in areas related to social commitment, research, health, accident prevention and insurance. The event was presided over by Her Majesty Queen Sofía. The José Manuel Martínez Lifetime Achievement Award, was presented to Vicente del Bosque for his commitment to society throughout his sporting career. In his acceptance speech, del Bosque expressed his thanks for the award, which he described as “both a responsibility and a boost in that it allows me to celebrate not only my sports career, which is what I’m best known for, as well as a number of social actions benefitting those most in need. I have always tried to ensure that my professional career is linked to a minimum social commitment, as should everyone.” The Salamanca native recognized that “in life, there comes a time when you get more out of giving than receiving”, and made mention of his son Álvaro, “without whom we wouldn’t know how to live”, when referring to the importance of being different, which he believes is what makes us special. “You have to appreciate difference, protect it and make it visible. Nobody and nothing is perfect. We must all be aware of this,” he said. At the event, which received a total of 884 nominations from all over the world, Fundación MAPFRE also recognized the merits of the Brazilian NGO Turma do Bem, which received the Best Social Action Initiative Award for the O Dentista do Bem project [The Good Dentist]. This project, which provides free dental care to 71,000 underprivileged children in 14 countries, is the largest specialized volunteer network in the world and the main project of this NGO, created by Dr. Fábio Bibancos at the end of the 1990s. Its objective is to enhance the social inclusion of disadvantaged children and young people aged between 11 and 17, providing them with dental treatment free of charge, thanks to the efforts of the more than 17,000 dentists comprising the organization. Organizations that help prevent and reduce accidents were also singled out for praise in the awards ceremony. In recognition of the effort made in this regard, Her Majesty Queen Sofía presented the Best Accident Prevention Initiative Award to the Organization of American Firefighters (OAF), which numbers more than one million firefighters among its ranks, the majority of whom work on a volunteer basis in the 65 percent of the countries in Latin America and the Caribbean where the OAF is active. Carlos Ferlise, President of the Organization of American Firefighters, who accepted the award, emphasized its importance, in that it recognizes “the least visible and most essential part of our work,” which is the passion with which these individuals protect their communities. “Our greatest success is to not make the news, and that no one is ever in danger.” In his speech, Ferlise highlighted the social awareness that unites all the firefighters in the organization: “men and women who leave their homes early in the morning not knowing what time they will be back”. He also stated that the 30,000 euros that comes with the award will go toward reinforcing the training of all the members of the organization. Women living in remote regions were in the spotlight with the awarding of the Best Health Promotion Initiative Award, which Her Majesty Queen Sofía presented to Fundación Enlace Hispano Americano de Salud (EHAS). This organization has been running its Healthy Pregnancy project for five years, and has delivered medical care to more than 16,000 pregnant women, thanks to a portable prenatal care kit that facilitates early identification of obstetric risks and the remote validation of diagnoses by an expert medical team. As a result of this innovative project, the Spanish NGO, which brings together institutions such as UPM, Engineers Without Borders and Universidad Rey Juan Carlos (URJC), among others, has succeeded in reducing infant and maternal mortality rates by 40 and 35 percent respectively. Finally, the Julio Castelo Matrán International Insurance Award, which recognizes organizations that contribute to the expansion of the insurance sector and promote economic stability, was awarded to the Wharton Risk Management and Decision Processes Center of the University of Pennsylvania, in the United States. The project that was recognized by this award was the Policy Incubator, where experts and researchers from different disciplines transform innovative ideas into real solutions that help communities at greater risk of suffering the effects of natural disasters. Caloryn Kousky, a researcher at the Wharton School, who launched this project just one year ago, highlighted that the policy incubator supports novel approaches that seek to increase recovery capacity in extreme situations through visionary ideas and functional solutions on the ground. In this regard, she mentioned that the annual worldwide cost of natural disasters comes to hundreds of billions dollars, with an impact that is disproportionately felt in marginal communities.